The Proprietary House (built 1762–64) in Perth Amboy, was the last residence for a Royal Governor of New Jersey. It is the only Provincial Governor's Mansion from the Thirteen Colonies that is still standing. West Jersey was largely a Quaker colony due to the influence of Pennsylvania founder William Penn and its prominent Quaker investors. Many of its early settlers were Quakers who came directly from England, Scotland, and Ireland to escape religious persecution. Although a number of the East Jersey proprietors in England were Quakers and First Governor Robert Barclay of Aberdeenshire Scotland (Ury served by proxy) was a leading Quaker theologian, the Quaker influence on the East Jersey government was insignificant. Many of East Jersey's early settlers came from other colonies in the Western Hemisphere, especially New England, Long Island, and the West Indies. Elizabethtown and Newark in particular had a strong Puritan character. East Jersey's Monmouth Tract, south of the Raritan River, was developed primarily by Quakers from Long Island. In 1702, both divisions of New Jersey were reunited as one royal colony by Queen Anne with a royal governor appointed by the Crown. Until 1738, this Province of New Jersey shared its royal governor with the neighboring Province of New York. The Province of New Jersey was governed by appointed governors until 1776. William Franklin, the province's last royal governor before the American Revolution (1775–83), was marginalized in the last year of his tenure, as the province was run de facto by the Provincial Congress of New Jersey. In June 1776, the Provincial Congress formally deposed Franklin and had him arrested, adopted a state constitution, and reorganized the province into an independent state. The constitution granted the vote to all inhabitants who had a certain level of wealth, including single women and blacks (until 1807). The newly formed State of New Jersey elected William Livingston as its first governor on 31 August 1776—a position to which he would be reelected until his death in 1790. New Jersey was one of the original Thirteen Colonies, and was the third colony to ratify the constitution forming the United States of America. It thereby was admitted into the new federation as a state on 18 December 1787. On 20 November 1789 New Jersey became the first state to ratify the Bill of Rights. New Netherland (Dutch: Nieuw-Nederland) was the seventeenth-century colonial province of the Republic of the Seven United Netherlands and the Dutch West India Company. It claimed territories along the eastern coast of North America from the Delmarva Peninsula to southwestern Cape Cod. 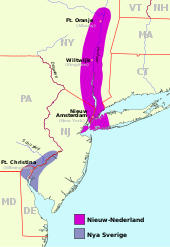 Settled areas of New Netherland now constitute the states of New York, New Jersey, Delaware, and Connecticut as well as parts of Pennsylvania and Rhode Island. The provincial capital New Amsterdam was located at the southern tip of the island of Manhattan at Upper New York Bay. New Netherland was conceived as a private business venture to exploit the North American fur trade. By the 1650s, the colony experienced dramatic growth and became a major port for trade in the North Atlantic. The leader of the Dutch colony was known by the title Director or Director-General. On 27 August 1664, four English frigates commanded by Richard Nicolls sailed into New Amsterdam's harbor and demanded the surrender of New Netherland. This event sparked the Second Anglo-Dutch War, which led to the transfer of the territory to England per the Treaty of Breda. Attempted to drive out Lenape tribe :passim. The New Sweden Company was chartered and included Swedish, Finnish, Dutch, and German stockholders. Minuit and his company arrived on the Fogel Grip and Kalmar Nyckel at Swedes' Landing (now Wilmington, Delaware) in the spring of 1638. Willem Kieft, Director of New Netherland, objected to the Swedish presence, but Minuit ignored his protests knowing that the Dutch were militarily impotent. The colony would establish Fort Nya Elfsborg, near present-day Salem, New Jersey, in 1643.:pp.70–73. In 1634, Charles I of England granted a charter to Sir Edmund Plowden, to establish a colony in North America north of lands granted to Lord Baltimore for the Maryland colony in 1633. The charter empowered Plowden to assume the title Lord Earl Palatinate, Governor and Captain-General of the Province of New Albion in North America, and poorly defined the boundaries of the New Albion colony. It is believed that the colony would have covered territory within present-day New Jersey, New York, Delaware, and Maryland. Captain Thomas Young and his nephew, Robert Evelyn, explored and charted the valley of the Delaware River (which they called the Charles River) in the 1630s. Plowden took several years to raise funds, and recruit settlers and "adventurers." In 1642, Plowden and several men sailed from England with aim to settle the colony. This attempt ended in an unsuccessful mutiny, and for the next seven years Plowden remained in Virginia managing the affairs of the intended colony, and selling land rights to adventurers and speculators. Plowden returned to England in 1649 to raise funds, and promote the colony as a refuge for Roman Catholics exiled during the English Civil War. Despite further attempts to return to his colony, Plowden was confined in a debtors prison and died a pauper in 1659. A notation on John Farrar's 1651 map of Virginia references Plowden's patent for the colony, and labels the Delaware River as "this river the Lord Ployden hath a patten of and calls it New Albion but the Swedes are planted in it and have a great trade of Furrs." With the 1664 surrender of New Netherland by Peter Stuyvesant, and under the authority and instruction James, Duke of York, Richard Nicolls assumed the position as Deputy-Governor of New Netherland (including Dutch settlements in New Jersey). :p.46 His first acts were to guarantee the Dutch colonists their property rights and religious freedom. Nicolls implemented the English common law and a legal code. :pp.43–44 Nicholls would remain governor until 1668, but the Duke of York granted part of the New Netherland territory (that between the Hudson and Delaware rivers, present day New Jersey), to Sir George Carteret and John Berkeley for their devoted service to the Duke of York and his brother Charles II during the English Civil War. This territory would be called the Province of New Caesaria, or New Jersey after Jersey in the English Channel—one of the last strongholds of the Royalist forces in the English Civil War. :p.60 (see Name of Jersey) As a result of this grant, Carteret and Berkeley became the two English Lords Proprietor of New Jersey. By the 1665 Concession and Agreement, the Lords Proprietor outlined the distribution of power in the province, offered religious freedom to all inhabitants, and established a system of quit-rents, annual fees paid by settlers in return for land. The two Lords Proprietor selected Carteret's brother Philip as the province's first governor. In 1673, during the Third Anglo-Dutch War, the Dutch were able to recapture New Amsterdam (renamed "New York" by the British) under Admiral Cornelis Evertsen the Youngest and Captain Anthony Colve. Evertsen had renamed the city "New Orange". Evertsen returned to the Netherlands in July 1674, and was accused of disobeying his orders. Evertsen had been instructed not to retake New Amsterdam, but instead, to conquer the British colonies of Saint Helena and Cayenne (now French Guiana). In 1674, the Dutch were compelled to relinquish New Amsterdam to the British under the terms of the Second Treaty of Westminster. Colve's authority ended on 9 February 1674 with the signing of the Treaty of Westminster, which restored the colony to the English. 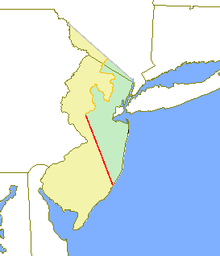 After the British regained New Jersey and New York, New Jersey was restored as a proprietary colony and was divided into two provinces—East Jersey and West Jersey. In 1674, Berkeley sold his interest in West Jersey to Edward Byllynge and John Fenwick (1618–83). Fenwick rushed to the colony to establish a settlement, Fenwick's Colony, that would become Salem. Due to Byllynge's financial difficulties encountered in his attempts to assert his title to the colony, he sought investment from William Penn, and others. Title issues were settled in 1676 with the negotiation of the Quintipartite Deed between Carteret, Penn, Byllynge, Nicholas Lucas, and Gawen Lawrie dividing the colony into East and West Jersey. West Jersey was largely a Quaker venture focused on the settlement of the lower Delaware River area, and was associated with William Penn and prominent figures in the colonization of the Pennsylvania. After Carteret's death, his heirs sold his interest in East Jersey to twelve investors, eleven of whom were members of the Religious Society of Friends (Quakers), who asked the Quaker apologist Robert Barclay to serve as governor. The settlement of East Jersey, and its commercial and political development was chiefly connected to New England and New York. This arrangement lasted for approximately thirty years, but because of issues of administration, the proprietors of both colonies surrendered their right to government to Queen Anne. On 17 April 1702, New Jersey was transformed into a crown colony. The proprietors would retain their land rights until the East Jersey proprietors dissolved their corporation (then New Jersey's oldest) in 1998. The West Jersey Proprietors, currently the second oldest corporation in North America, continues as an activity entity based in Burlington, New Jersey. In 1674, Andros was appointed to oversee the Duke of York's possessions in the Province of New York. Andros assumed that included his possessions in New Jersey as well. Carteret and proprietors in New Jersey resisted Andros's claim. He returned to England in 1678 for instructions. Andros returned with a mandate from the Duke of York to control both colonies and attempted to assert his authority. Governor Carteret continued to resist his claim. After Sir George Carteret's death in 1680 and Philip Carteret's acquittal, Andros assumed authority over the colony for 10 months. Andros was recalled to England in January 1681 under the pretense of facing financial corruption charges but more because he was a political liability to the Duke of York. Barclay was leader of the Quaker movement and one of the foremost Quaker apologists. Despite the brief interlude of the Dominion of New England, Barclay claimed the governorship until his death in 1690. Deputy Governors included Thomas Rudyard (1682–83), Gawen Lawrie (1683–86), Neill Campbell (1686–87), and Andrew Hamilton (1687–88). Governor of the Dominion of New England. Administration of East Jersey, West Jersey, and New York colonies during this brief period overseen by Lieutenant Governor Francis Nicholson. The East Jersey Proprietors nominated two men, John Tatham and Colonel Joseph Dudley, both of whom were rejected. One historian claims Tatham served briefly as governor. Tatham may have been rejected because of suspicion of culpability in the death of James Budd; Dudley because of his ties to Andros. Deposed by the Board of Trade on the instigation of Jeremiah Basse under the claim that "no other than a natural-born subject of England could serve in any public post of trust or profit" (Hamilton was Scottish) in accordance with the Navigation Act of 1696. Basse convinced the Board of Trade to depose Hamilton, and he advocated against the colonial proprietors. Nominated to replace Hamilton by the Board of Trade in 1697. The administration of the colony suffered under his governorship, he was recalled to England in 1699. He returned to New Jersey in 1703 and later served as secretary for Lord Cornbury and Lord Lovelace, before his conviction for perjury. He would remain involved in provincial politics until his death in 1725. Reappointed in 1699, after the King's attorney general and solicitor general ruled that the Navigation Act of 1696 did not prohibit Scotsmen from holding office. By his death in April 1703, he had not been relieved of his position as governor. Byllynge, a London brewer who never came to West Jersey died in England in 1687. Deputy Governors included Samuel Jennings (1681–84), Thomas Olive (1684) and John Skene (1684–87). Dr. Coxe never left England and became Governor of West Jersey after purchasing the holdings of Edward Byllynge from his heirs. After being dissuaded by family and friends not to travel to West Jersey, Coxe sells part of his land holdings and the right to government to the West Jersey Society. Edward Hunloke served as Dr. Coxe's deputy governor (1690–92) until his sale of the colony to the West Jersey Society, which appointed Hamilton. Chosen by the Provincial Council to serve as deputy governor during Basse's journey to England, and served until Hamilton's arrival. John Fenwick, the founder of New Salem (now Salem, New Jersey) the first Quaker settlement in West Jersey, signed a treaty with the Lenape beneath the "Salem Oak" in 1675. The oak tree is said to be approximately 600 years old. Shortly after ascending to the British throne, Queen Anne (1665–1714) reunited East Jersey and West Jersey as a royal colony and appointed her cousin Edward Hyde, Viscount Cornbury, as the province's first Royal Governor. In 1702, the governments of the two proprietary colonies had surrendered their authority to the Crown which reorganized New Jersey into a crown colony with a government that consisted of a governor and twelve-member council appointed by the British monarch, and a twenty-four-member assembly whose members were elected by colonists who were qualified to vote by owning at least 1,000 acres of land. For the next four decades, New Jersey and New York shared one royal governor. Because the crown's representatives were generally incompetent or corrupt, and the royal governor often ignored New Jersey and its affairs, the colonists had substantial autonomy, and the proprietors continued to wield considerable power through the retained control of land titles and sales. The relationship between many of the Royal Governors and the provincial assembly was often hostile. The assembly would simply respond to disagreements over legislation by using its appropriation power to withhold the governor's salary. Several historians point towards a factionalism which defined the colonial government, but the factions have been described as inchoate and characterized by shifting alliances between the colony's various ethnic, religious, proprietary, and landowning groups. Lord Cornbury's tenure was marked with accusations of cross-dressing, corruption, arrogance, and decadence. Historians claim that he illustrated the worst form of the English aristocracy's "arrogance, joined to intellectual imbecility" and characterise him as a "degenerate and pervert who is said to have spent half of his time dressed in women's clothes", a "fop and a wastrel". He was recalled by Queen Anne who received several complaints from colonists of "numerous malpractices and misappropriations". Lord Lovelace died in office, in a short tenure marked by prosecuting Governor Jeremiah Basse and other supporters of Lord Cornbury. An army officer who served as Lieutenant Governor under Lord Cornbury and Lord Lovelace, and acting governor upon the death of Lovelace. His commission for governorship was revoked in October 1709, but the news only reached him in April 1710. Hunter sailed to America in 1710 with 3,000 Palatine German (Kurpfälzische) refugees who encamped in the Hudson Valley, and then settled in upstate New York and New Jersey. Hunterdon County was named in his honour. Burnet left office after being appointed Governor of Massachusetts and New Hampshire. Montgomerie died in office after an epileptic seizure. Acting governor after death of Governor Montgomerie, as President of Council. Morris actively advocated to separate New Jersey from New York control from 1728–38. Assumed office 7 August 1732 when he arrived at Sandy Hook. He rarely visited New Jersey and only met the provincial council or assembly eight times. He died in office in 1736 from tuberculosis. In New York, Cosby prosecuted John Peter Zenger, a newspaper publisher for libel after Zenger's newspaper severely criticized his administration. Acting governor in his role as President of Council, after the death of acting governor Anderson. Lewis Morris is said to have served as acting governor during this time, although his authority was disputed. West never travelled to America. Resigned before taking the governorship so that he could continue serving in the military and in the House of Lords. Built in 1756, Nassau Hall, or "Old Nassau" is the oldest building at Princeton University which was chartered by New Jersey's royal governor ten years earlier. After tensions were provoked with the Penn's Walking Purchase in 1737, relations between colonists and the region's Native American tribes became increasingly hostile. During these years, colonists left the seacoast cities and settled the colony's northwestern wilderness. Much of the provincial government's actions during this time was organizing the wilderness into townships often named after English and colonial political figures. By the 1750s, violent raids against these settlers, and fears that the French were supporting these hostilities led to the French and Indian War. New Jersey was the only province to have two colleges established during the colonial period, and the colony's governors were influential in their establishment. Governors John Hamilton, John Reading, and Jonathan Belcher aided the establishment of The College of New Jersey (now Princeton University) which was founded in 1746 in Elizabethtown by a group of Great Awakening "New Lighters" that included Jonathan Dickinson, Aaron Burr, Sr. and Peter Van Brugh Livingston. In 1756, the school moved to Princeton. In 1766, Governor William Franklin issued the charters to establish Queens College (now Rutgers University) in New Brunswick to "educate the youth in language, liberal, the divinity, and useful arts and sciences" and for the training of future ministers for the Dutch Reformed Church. Franklin issued a second charter in 1770 after the college's trustees requested amendments. In the last year of William Franklin's tenure, his power was diminished and he became marginalized by the rebellious sentiment rising in the colony's residents. The province was being run de facto by the Provincial Congress of New Jersey (1775–76). While colonial militia had put Franklin under house arrest in January 1776, he would not be formally deposed until June 1776 when the colony's Provincial Congress had him imprisoned. Franklin considered the Provincial Congress to be an "illegal assembly." Under the direction of its president Samuel Tucker (1721–89), the Provincial Congress proceeded to adopt a state constitution and reorganize the province into an independent state. The newly formed State of New Jersey elected William Livingston as its first governor on 31 August 1776. Previously served in the Provincial Council, Assembly and as acting governor. Morris died in office in 1746. Morris County, Morristown, Morris Plains, and Morris Township are named in his honour. Morris's tenure was marked with bitter disputes and deadlocks between himself and factions in the colonial legislature—so bitter that after his death when his widow requested the arrears on his salary, the legislature refused citing that the request was "a subject so universally disliked...there is none will say one Word in its Favour." Acting governor in his role as President of Council. Readington Village and Readington Township in Hunterdon County was named in his honour. Aided the early development of The College of New Jersey (now Princeton University). Fortified the upper Delaware River valley to prevent Indian attacks during the French and Indian War. Thomas Pownall was appointed to be Belcher's Lieutenant Governor (1755–57), the first since Richard Ingoldesby served under Lord Cornbury and Lord Lovelace, and the last until the state reinstated the office in 2010. Pownall assumed the governorship of Massachusetts on August 3, 1757. Belcher died in office on 31 August 1757. Arrived in Perth Amboy, New Jersey, on 14 June 1758. In late 1759 was appointed governor of Massachusetts. Bernardsville, a borough in Somerset County is named in his honour. Appointed in 1759, but did not arrive in New Jersey until 10 May 1760, and did not meet with the colonial assembly until 30 October 1760. In 1761, Boone was appointed Governor of South Carolina. Boonton in Morris County was named in his honour. Son of Vice-Admiral Sir Charles Hardy (1680–1744), Lord commissioner of the Admiralty, brother to Sir Charles Hardy (1716–80), Royal Governor of New York. Hardy gained "a reputation for promptness, attentiveness and openness" as New Jersey's governor. Replaced in 1763 in an effort to impose greater imperial authority over the colonies following the French and Indian War. Hardyston Township in Sussex County was named in his honour. Despite his reputation for arrogance, stubbornness and a fiery temper, Franklin is considered one of the more popular and successful chief executives in New Jersey history. Issued charters to found Queen's College (now Rutgers University). Franklin was placed under house arrest by colonial militia in 1776 by the order of the Provincial Congress of New Jersey, an entity he referred to as an "illegal assembly." Franklin Township and Franklin Lakes in Bergen County, and possibly Franklin Township in Somerset County, were named in his honour. For post-independence governors (1776–present), see List of Governors of New Jersey. ^ The Proprietary House Museum (Perth Amboy, New Jersey). The Proprietary House: History Archived 18 January 2014 at the Wayback Machine Archived 18 January 2014 at the Wayback Machine (from the museum's website). Retrieved 29 June 2013. ^ New Jersey Department of State, Division of Travel and Tourism. "Proprietary House The Royal Governor's Mansion" Archived 4 March 2014 at the Wayback Machine Archived 4 March 2014 at the Wayback Machine (official state tourism website). Retrieved 29 June 2013. ^ Firth, C.H. ; Knighton, C. S. (revised). "Carteret, Sir George, first baronet (1610?–80), naval officer and administrator" Oxford Dictionary of National Biography. (Oxford: Oxford University Press, 2004; online edn, January 2008). ^ Hayton, D. W. "Berkeley, John, first Baron Berkeley of Stratton (bap. 1607, d. 1678), royalist army officer and courtier" Oxford Dictionary of National Biography. (Oxford: Oxford University Press, 2004; online edn, January 2008). ^ a b "The Duke of York's Release to John Lord Berkeley, and Sir George Carteret, 24th of June, 1664" from Leaming, Aaron and Spicer, Jacob. The Grants, Concessions, and Original Constitutions of the Province of New-Jersey. The acts passed during the proprietary governments, and other material transactions before the surrender thereof to Queen Anne. The instrument of surrender, and her formal acceptance thereof, Lord Cornbury's Commission and Introduction consequent thereon. (2nd Edition. Philadelphia: William Bradford, 1758), 8–11. Published online at the Avalon Project: Documents in Law, History and Diplomacy, Yale Law School, Lillian Goldman Law Library. Retrieved 5 April 2013. ^ "Quintipartite Deed of Revision, Between E. and W Jersey: July 1st, 1676" from Thorpe, Francis Newton (editor). The Federal and State Constitutions Colonial Charters, and Other Organic Laws of the States, Territories, and Colonies Now or Heretofore Forming the United States of America Volume IV. (Washington, D.C.: Government Printing Office, 1909). Published online at the Avalon Project: Documents in Law, History and Diplomacy, Yale Law School, Lillian Goldman Law Library. Retrieved 5 April 2013. ^ Gordon, Thomas Francis. The history of New Jersey: from its discovery by Europeans, to the adoption of the Federal Constitution. (Trenton, New Jersey: Daniel Fenton, 1834), 73. ^ a b Pomfret, John Edwin. The Province of West New Jersey, 1609–1702: A History of the Origins of an American Colony. (New York: Octagon Books, 1956). ^ a b Whitehead, William A. 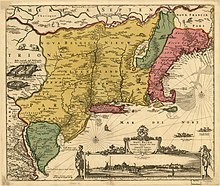 East Jersey Under the Proprietary Governments: A Narrative of Events connected with the Settlement and Progress of the Province, until the Surrender of the Government to the Crown in 1703. [sic] (Newark, New Jersey: New Jersey Historical Society, 1875). ^ Pomfret, John E. The Province of East New Jersey, 1609–1702: The Rebellious Proprietary. (Princeton: Princeton University Press, 1962). ^ Salter, Edwin. A History of Monmouth and Ocean Counties: Embracing a Genealogical Record of Earliest Settlers in Monmouth and Ocean Counties and Their Descendants. (Bayonne, New Jersey: E Gardner & Son, 1890), 24. ^ Steen, James. New Aberdeen: Or the Scotch Settlement of Monmouth County, New Jersey. (Matawan, NJ: Journal Steam Print, 1899), 5. ^ a b c d e "Surrender from the Proprietors of East and West New Jersey, of Their Pretended Right of Government to Her Majesty; 1702" from Leaming, Aaron and Spicer, Jacob. The Grants, Concessions, and Original Constitutions of the Province of New-Jersey. The acts passed during the proprietary governments, and other material trnasactions before the surrender thereof to Queen Ann. [sic] The instrument of surrender, and her formal acceptance thereof, Lord Cornbury's Commission and Introduction consequent thereon. (2nd Edition. Philadelphia: William Bradford, 1758) 600–618. Published online at the Avalon Project: Documents in Law, History and Diplomacy, Yale Law School, Lillian Goldman Law Library. Retrieved 5 April 2013. ^ Farnham, Mary Frances (compiler). "Farnham Papers (1603–88)" in Volumes 7 and 8 of Documentary History of the State of Maine. (Portland, Maine: Collections of the Maine Historical Society, 2nd Series. 1901–02), 7:311–314. ^ Parry, Clive (editor). Consolidated Treaty Series 231 Volumes. (Dobbs Ferry, New York: Oceana Publications, 1969–81), 10:231. ^ a b c d e f g h i j k Shorto, Russell. The Island at the Center of the World: The Epic Story of Dutch Manhattan and the Forgotten Colony that Shaped America. (New York City: Vintage Books, 2004). ^ a b Llewellyn, Louisa W. (editor), et al. "Chapter Two: English and Irish Quakers Arrive at Gloucester" in First Settlement on the Delaware River: A History of Gloucester City, New Jersey. (Gloucester City, New Jersey: Gloucester City American Revolution Bicentennial Committee, 1976), 17–33. Retrieved 8 June 2013. ^ Winfield, Charles H. History of the County of Hudson, New Jersey, from its earliest settlement to the present time (New York: Kennard & Hay Stationery M'fg and Printing Co., 1874), 68–69. ^ Weslager, Charles A. New Sweden on the Delaware 1638–55 (Wilmington, Delaware: The Middle Atlantic Press, 1988). ^ a b c d e Hoffecker, Carol, et al. (editors). New Sweden in America (Newark, Delaware: University of Delaware Press, 1995). ^ Mickley, Joseph J. Some account of Willem Usselinx and Peter Minuit: Two individuals who were instrumental in establishing the first permanent colony in Delaware (Wilmington, Delaware: The Historical Society of Delaware, 1881). ^ a b c d Hazard, Samuel. Annals of Pennsylvania from the Discovery of the Delaware, 1609–82. (Philadelphia: Hazard and Mitchell, 1850). ^ Weslager, Charles A. A Man and his Ship: Peter Minuit and the Kalmar Nyckel. (Wilmington, Delaware: Kalmar Nickel Foundation, 1989). ^ Heite, Edward F. and Heite, Louise B. (SOPA/Camden, Delaware). "Report of Phase I archaological [sic] and historical investigations at the site of FORT CASIMIR New Castle, Delaware. Prepared for Trustees of the New Castle Commons." and an analysis titled "Where Was Fort Casimir? Historical And Archaeological Evidence From The 1986 Heite Report." from the New Castle, Delaware Community History and Archaeology Program. Retrieved 6 April 2013. ^ Kanslirådet Georg Luther, Helsingfors (1992). "Släkten Hollender Ridder" Archived 13 February 2012 at the Wayback Machine Archived 13 February 2012 at the Wayback Machine in Genos 63:1–11, 27–28. ^ Dahlgren, Stellan, and Norman, Hans; and Nelson, Marie Clark (translator) The Rise and Fall of New Sweden: Governor Johan Risingh's Journal 1654–1655 in Its Historical Context. (Stockholm, Sweden: Uppsala, 1988). ^ a b Carter, Edward C., II, and Lewis, Clifford, III. "Sir Edmund Plowden and the New Albion Charter, 1632–1785" in The Pennsylvania Magazine of History and Biography. LXXXIII:2 (April 1959). ^ Charles Varlo (compiler). "The Grant of King Charles the First, to Sir Edmund Plowden, Earl Palatine of Albion, of the Province of New Albion, in America, June 21, A.D., 1634" (London: s.n., 1785) in the Charles Varlo Papers, Rare Books and Manuscripts Collection, New York Public Library, New York City. ^ Hazard, Ebenezer (editor). Historical Collections, considering of State Papers and other Authentic Documents. (Philadelphia: s.n., 1792) I:172. ^ Scharf, Thomas J. History of Delaware, 1609–88. Volume I. (Philadelphia: L.J. Richards & Co., 1888), 57–61. ^ Evelyn, Robert. "A direction for adventurers with small stock to get two for one, and good land freely and for gentlemen and all servants, labourers, and artificers to live plentifully." (London: s.n., 1641). ^ a b Lewis, Clifford Lewis III. "Some Extracts Relating to Sir Edmund Plowden and Others from the Lost Minutes of the Virginia Council and General Court: 1642–45" and "Some Notes on Sir Edmund Plowden's Attempts to Settle His Province of New Albion" in William and Mary Historical Quarterly. (January 1940). ^ Farrar, John. "A mapp of Virginia discovered to ye hills" (1651) printed in Williams, Edward. Virgo Triumphans: or, Virginia richly and truly valued. (London: s.n., 1651). ^ a b Schuyler Van Rensselaer. History of the City of New York in the Seventeenth Century: New Amsterdam (New York: Macmillan, 1909), 527. ^ a b c d e f Smith, Samuel. The History of the Colony of Nova Cæsarea, Or New Jersey: Containing, an Account of Its First Settlement, Progressive Improvements, the Original and Present Constitution, and Other Events to the Year 1721. With Some Particulars Since and a Short View of Its Present State. (Burlington, New Jersey: James Parker, 1765). ^ "The Concession and Agreement of the Lords Proprietors of the Province of New Caesarea, or New Jersey, to and With All and Every the Adventurers and All Such as Shall Settle or Plant There – 1664" from Thorpe, Francis Newton (editor). The Federal and State Constitutions Colonial Charters, and Other Organic Laws of the States, Territories, and Colonies Now or Heretofore Forming the United States of America. Volume IV. (Washington, DC: Government Printing Office, 1909). Published online at the Avalon Project: Documents in Law, History and Diplomacy, Yale Law School, Lillian Goldman Law Library. Retrieved 5 April 2013. ^ Grabas, Joseph A. "Land Speculation and Proprietary Beginnings of New Jersey" in The Advocate (New Jersey Land Title Association) (December 2004) XVI(4): 3, 14, 20. ^ Roosevelt, Theodore. "IV. New Amsterdam becomes New York The Beginning of English Rule. 1664–74," in New York: A Sketch of the City's Social, Political, and Commercial Progress from the First Dutch Settlement to Recent Times. (New York: Charles Scribner & Sons, 1906). ^ Barrevald, Dirk J. From New Amsterdam to New York: The Founding of New York by the Dutch in July 1625. (Lincoln, Nebraska: Writers Club Press, 2001), 248. ^ Westdorp, Martina. "Behouden of opgeven? Het lot van de nederlandse kolonie Nieuw-Nederland na de herovering op de Engelsen in 1673" Archived 30 June 2008 at the Wayback Machine Archived 30 June 2008 at the Wayback Machine in De wereld van Peter Stuyvesant (in Dutch). Retrieved 21 March 2013. ^ Prak, Maarten. The Dutch Republic in the Seventeenth Century: The Golden Age. (Cambridge: Cambridge University Press, 2005), 116. ^ Snyder, John Parr. The Story of New Jersey's Civil Boundaries: 1606–1968. (Trenton, New Jersey: Bureau of Geology and Topography, 1969), 9ff. ^ Clement, John.A sketch of the life and character of John Fenwick, published by Friends Historical Association. (Philadelphia: Henry S. Volkmar, 1875); Shourds, Thomas "John Fenwick." in History and Genealogy of Fenwick's Colony, New Jersey. (Bridgeton, New Jersey: s.n., 1876), 3–17. ^ Snyder, John Parr. The Mapping of New Jersey: The Men and Their Art. (New Brunswick, New Jersey: Rutgers University Press, 1973), passim. ^ a b DesBrisay, Gordon. "Barclay, Robert, of Ury (1648–90)" in Oxford Dictionary of National Biography (Oxford: Oxford University Press, 2004). Retrieved 15 June 2013. ^ a b New Jersey Law Revision Commission. Final Report relating to Fair Resolution of Proprietary Title Claims Act, June 1999 (Newark, NJ). Retrieved 29 April 2013. ^ James, George. "Long on Ceremony, Short on Business" in The New York Times (15 April 2001). ^ Godfrey, Carlos E. "When Boston was New Jersey's Capital" in Proceedings of the New Jersey Historical Society 51 (1933) 1–23. ^ Dunn, Randy. "Patronage and Governance in Francis Nicholson's Empire". English Atlantics Revisited. (Montreal: McGill-Queens Press, 2007), 64. ^ a b c d Lovejoy, David. The Glorious Revolution in America. (Middletown, CT: Wesleyan University Press, 1987). ^ a b Webb, Stephen Saunders. Lord Churchill's Coup: The Anglo-American Empire and the Glorious Revolution Reconsidered. (Syracuse, New York: Syracuse University Press, 1998), 202, 522–523. ^ a b c d Stellhorn, Paul A., and Birkner, Michael J. "Philip Carteret" Archived 12 November 2013 at the Wayback Machine "Archived copy" (PDF). Archived from the original (PDF) on 12 November 2013. Retrieved 6 July 2013. CS1 maint: Archived copy as title (link) in The Governors of New Jersey 1664–1974: Biographical Essays. (Trenton, New Jersey: New Jersey Historical Commission, 1982), 15–17. ^ a b c d e Stellhorn, Paul A., and Birkner, Michael J. "Edmund Andros" in The Governors of New Jersey 1664–1974: Biographical Essays. (Trenton, New Jersey: New Jersey Historical Commission, 1982), 18–21. ^ Stellhorn, Paul A., and Birkner, Michael J. "Robert Barclay" in The Governors of New Jersey 1664–1974: Biographical Essays. (Trenton, New Jersey: New Jersey Historical Commission, 1982), 26. ^ a b Pomfret, John Edwin. The Province of West New Jersey, 1609–1702: A History of the Origins of an American Colony. (New York: Octagon Books, 1956), 158. ^ a b Bisbee, Henry H. "John Tatham, Alias Gray." The Pennsylvania Magazine of History and Biography Volume 83, Number 3 (July 1959): 253–264. ^ McCormick, John D. "John Tatham, New Jersey's First Catholic Governor". American Catholic Historical Society Researches (1888), 79–92. ^ Whitehead, William A. "Elizabethtown Bill in Chancery," East Jersey Under the Proprietary Governments (Newark, New Jersey: Martin R. Dennis, 1875), 124. ^ a b c d e f Weeks, Daniel J. Not for filthy Lucre's sake: Richard Saltar and the antiproprietary movement in East New Jersey, 1665–1707. (Lehigh University Press, 2001), 86ff. ^ a b c d e f Stellhorn, Paul A., and Birkner, Michael J. "Jeremiah Basse (d. 1725)" in The Governors of New Jersey 1664–1974: Biographical Essays. (Trenton, New Jersey: New Jersey Historical Commission, 1982), 33–35. Retrieved 29 April 2013. ^ Stellhorn, Paul A., and Birkner, Michael J. "Andrew Hamilton" in The Governors of New Jersey 1664–1974: Biographical Essays. (Trenton, New Jersey: New Jersey Historical Commission, 1982), 30–33. ^ Stellhorn, Paul A., and Birkner, Michael J. "Edward Byllynge" in The Governors of New Jersey 1664–1974: Biographical Essays. (Trenton, New Jersey: New Jersey Historical Commission, 1982), 21–24. ^ Hunter, Michael. "Coxe, Daniel". Oxford Dictionary of National Biography. Oxford University Press. ^ a b Mulford, Isaac S., M.D. Civil and Political History of New Jersey. (Camden, New Jersey: Keen & Chandler, 1848), 266–268. ^ Scull, G. D. "Biographical Notice of Doctor Daniel Coxe, of London". The Pennsylvania Magazine of History and Biography Vol. 7 (1883): 317–337. ^ Staff. "Public invited to gather acorns from the historic Salem Oak, start own saplings" in Today's Sunbeam (2 October 2010). Retrieved 29 June 2013. ^ Bonomi, Patricia U. "Hyde, Edward, third earl of Clarendon (1661–1723)" in Oxford Dictionary of National Biography. (Oxford: Oxford University Press, 2004). ^ For a discussion of the factionalism and early political issues, see: Weeks, Daniel J. Not For Filthy Lucre's Sake: Richard Saltar and the Antiproprietary Movement in East New Jersey, 1665–1707. (Lehigh University Press, 2001); McConville, Brendan. These Daring Disturbers of the Public Peace: The Struggle for Property and Power in Early New Jersey. (Ithaca: Cornell University Press, 1999); Batinski, Michael. The New Jersey Assembly, 1738–75: The Making of a Legislative Community. (Lanham, Maryland: University Press of America, 1987); Gerlach, Larry R., "Quaker Politics in Eighteenth Century New Jersey: A Documentary Account" in Journal of the Rutgers University Library 34 (1970): 1–12; Pulvis, Thomas L. Proprietors, Patronage and Paper Money: Legislative Politics in New Jersey 1703–76. (New Brunswick, New Jersey: Rutgers University Press), 1986; and Newcomb, Benjamin H. Political Partisanship in the American Middle colonies, 1700–76. (Baton Rouge: Louisiana State University Press, 1995). ^ Damon, Charles Ripley. The Dictionary of American Dates, 458 to 1920. 3 volumes. (Boston: Richard G. Badger/The Gorham Press, 1921), 60, 67. ^ a b For a history of Palatine emigration, see: Knittle, Walter Allen. Early Eighteenth Century Palatine Emigration: A British Government Redemptioner Project to Manufacture Naval Stores. (Philadelphia: Dorrance, 1937); Statt, Daniel. Foreigners and Englishmen: The Controversy over Immigration and Population, 1660–1760. (Newark, Delaware: University of Delaware Press, 1995); Chambers, Theodore Frelinghuysen (Rev.). The Early Germans of New Jersey: their History, Churches and Genealogies. (Dover, New Jersey: Dover Printing Company, 1895); Otterness, Philip. Becoming German: The 1709 Palatine Migration to New York. (Ithaca, New York: Cornell University Press, 2006). ^ For Dutch settlement in the Raritan Valley: Snell, James P. and Ellis, Franklin (compilers). History of Hunterdon and Somerset counties, New Jersey, with illustrations and biographical sketches of its prominent men and pioneers (Philadelphia: Everts & Peck, 1881), passim; Messler, Abraham. Forty years at Raritan : eight memorial sermons with notes for a history of the Reformed Dutch churches in Somerset County, N.J. (New York: A. Lloyd, 1873), passim. ; and Wall, John P. History of Middlesex County, New Jersey, 1664–1920. 3 volumes. (New York: Lewis Publishing Company, 1921), passim. ^ For Dutch and Huguenot settlement in the Hackensack Valley: Demarest, David D. The Hugenots on the Hackensack. (New Brunswick, New Jersey: The Daily Fredonian steam printing house, 1886); Van Valen, James M. History of Bergen County, New Jersey (New York: New Jersey Publishing & Engraving Co., 1900), passim. ^ For Dutch and Huguenot settlement in the Minisink: Decker, Amelia Stickney. That Ancient Trail. (Trenton, New Jersey: Privately printed, 1942); Hine, Charles Gilbert. The Old Mine Road. (New Brunswick, New Jersey: Rutgers University Press, 1908); Vosburgh, Royden Woodword (editor). Minisink Valley Reformed Dutch Church records, 1716–1830. (New York: New York Genealogical and Biographical Society, 1913; reprinted Bowie, Maryland: Heritage Books, Inc., 1992). ^ a b c Lurie, Maxine N. and Veit, Richard F. New Jersey: A History of the Garden State. (New Brunswick, New Jersey: Rutgers University Press, 2012). ^ Bonomi, Patricia U. Lord Cornbury Scandal: The Politics of Reputation in British America. (Chapel Hill, North Carolina: The University of North Carolina Press, 2000). ^ Ross, Shelley. Fall From Grace (New York: Random House, 1988). ^ Stellhorn, Paul A., and Birkner, Michael J. "Edward Hyde, Viscount Cornbury" in The Governors of New Jersey 1664–1974: Biographical Essays. (Trenton, New Jersey: New Jersey Historical Commission, 1982), 36–38. ^ Stellhorn, Paul A., and Birkner, Michael J. "John Lovelace, Baron of Hurley" in The Governors of New Jersey 1664–1974: Biographical Essays. (Trenton, New Jersey: New Jersey Historical Commission, 1982), 39–40. ^ Stellhorn, Paul A., and Birkner, Michael J. "Richard Ingoldesby" Archived 21 September 2013 at the Wayback Machine "Archived copy" (PDF). Archived from the original (PDF) on 21 September 2013. Retrieved 6 July 2013. CS1 maint: Archived copy as title (link) in The Governors of New Jersey 1664–1974: Biographical Essays. (Trenton, New Jersey: New Jersey Historical Commission, 1982), 40–43. ^ Snell, James P. History of Hunterdon and Somerset Counties, New Jersey with Illustrations and Biographical Sketches of its Prominent Men and Pioneers (Philadelphia: Everts & Peck, 1881), 191. ^ Stellhorn, Paul A., and Birkner, Michael J. "William Burnet" Archived 22 March 2012 at the Wayback Machine Archived 22 March 2012 at the Wayback Machine in The Governors of New Jersey 1664–1974: Biographical Essays. (Trenton, New Jersey: New Jersey Historical Commission, 1982), 46–48. ^ Lepore, Jill. New York Burning: Liberty, Slavery, and Conspiracy in Eighteenth-Century Manhattan. (New York: Random House, 2006), 25. ^ a b c d e Stellhorn, Paul A., and Birkner, Michael J. "Lewis Morris" in The Governors of New Jersey 1664–1974: Biographical Essays. (Trenton, New Jersey: New Jersey Historical Commission, 1982), 54–58. Retrieved 29 April 2013. ^ Stellhorn, Paul A., and Birkner, Michael J. "William Cosby (1690–1736)" in The Governors of New Jersey 1664–1974: Biographical Essays. (Trenton, New Jersey: New Jersey Historical Commission, 1982), 52–54. Retrieved 29 April 2013. ^ New Jersey Colonial Documents, Archives of the State of New Jersey, First Series, Vol. V. (Newark, New Jersey: Daily Advertiser Publishing House, 1882), 490–491. ^ Orange Key Virtual Tour. Stop 8 "Front Campus" (including Nassau Hall) on the Princeton University website. Retrieved 29 June 2013. ^ New Jersey Department of State, Division of Travel and Tourism. "Nassau Hall" Archived 29 June 2013 at Archive.today Archived 29 June 2013 at Archive.today (official state tourism website). Retrieved 29 June 2013. ^ Fenton, William N. The Great Law and the Longhouse: a political history of the Iroquois Confederacy. (Norman, Oklahoma: University of Oklahoma Press, 1998), 398. ^ a b Harper, Steven Craig. Promised Land: Penn's Holy Experiment, The Walking Purchase, and the Dispossession of the Delawares, 1600–1763. (Cranbury, New Jersey: Rosemont Publishing, 2008). ^ a b Nelson, William (editor). Documents Relating to the Colonial History of the State of New Jersey: Extracts from American Newspapers, Relating to New Jersey, Volume IV. 1756–61. Archives of the State of New Jersey, First Series, Volume 20. (Newark, New Jersey: New Jersey Historical Society, 1898), passim. ^ a b Larrabee, Edward Conyers McMillan. "New Jersey and the Fortified Frontier System of the 1750s." Ph.D. Dissertation, Columbia University, 1970. ^ Ward & Trent, et al. "XXIII. Education. § 13. Colonial Colleges." in The Cambridge History of English and American Literature (New York: G.P. Putnam's Sons, 1907–21; New York: Bartleby.com, 2000). ^ Norris, Edwin Mark. The Story of Princeton. (Boston: Little, Brown, and Company, 1917), 12, 17. ^ Princeton University. General Catalogue of Princeton University, 1746–1906. (Princeton: Princeton University, 1908), 9, 14. ^ Series 2: Trustees Charters and Bylaws, and other College Rules; 1746–2006; Board of Trustees Records, Princeton University Archives, Department of Rare Books and Special Collections, Princeton University Library. ^ a b Oberdorfer, Don. Princeton University: The First 250 Years. (Princeton: Princeton University Press, 1995), passim. ^ Frusciano, Thomas J. A Historical Sketch of Rutgers University. New Brunswick, New Jersey: Rutgers University Libraries. Retrieved 22 March 2013. ^ "Charter of a College to be erected in New-Jersey, by the Name of Queen's-College." (New York: John Holt, 1770); in the collection of Special Collections and University Archives, Alexander Library, Rutgers, The State University of New Jersey, New Brunswick, New Jersey. ^ a b McCormick, Richard P. Rutgers: A Bicentennial History. (New Brunswick, New Jersey: Rutgers University Press, 1966), passim. ^ a b Skemp, Sheila L. William Franklin: Son of a Patriot, Servant of a King. (Oxford: Oxford University Press, 1990), 211. ^ Schuyler, Hamilton. "Chapter II: Trenton and Trentonians in the Revolutionary Era" in A History of Trenton, 1679–1929: Two Hundred and Fifty Years of a Notable Town with Links in Four Centuries. (Trenton, New Jersey: Trenton Historical Society, 1929). ^ Kemmerer, Donald L. Path to Freedom, The Struggle for Self Government in Colonial New Jersey 1703–76. (Princeton: Princeton University Press, 1940). ^ McCormick, Richard P. (1964, 1970). New Jersey from Colony to State, 1609–1789. (1st Ed – Princeton: Van Nostrand, 1964; 2nd Ed. — New Brunswick, New Jersey: Rutgers University Press, 1970). ^ Staff. "Morristown Timeline" in The Daily Record (23 March 2000). ^ Readington Township Historic Preservation Commission, Readington Township Museum Committee. Images of America: Readington Township. (Charleston, South Carolina: Arcadia Publishing, 2008), 9. ^ Fisher, Edgar Jacob. New Jersey as a Royal Province, 1738 to 1776. (New York: Columbia University Press, 1911), 43–44. ^ Schutz, John. Thomas Pownall, British Defender of American Liberty; a Study of Anglo-American Relations in the Eighteenth Century. (Glendale, California: A. H. Clark, 1951), 55–58, 78–87. ^ Stellhorn, Paul A., and Birkner, Michael J. "Jonathan Belcher" in The Governors of New Jersey 1664–1974: Biographical Essays. (Trenton, New Jersey: New Jersey Historical Commission, 1982), 58–62. ^ Stellhorn, Paul A., and Birkner, Michael J. "Francis Bernard" in The Governors of New Jersey 1664–1974: Biographical Essays. (Trenton, New Jersey: New Jersey Historical Commission, 1982), 62–65. ^ Nicolson, Colin. The "Infamas Govener" Francis Bernard and the Origins of the American Revolution. (Boston, Massachusetts: Northeastern University Press, 2000), 45. ^ Staff. "A look at Bernards through the centuries", in The Courier-News (27 August 2003)." ^ Namier, L. B. (July 1939). "Charles Garth and his Connexions". The English Historical Review (Vol. 54, Number 215): 443–470. ^ McCrady, Edward. The History of South Carolina Under the Royal Government, 1719–76. (New York City: The Macmillan Company, 1899), 353. ^ Lyon, Isaac S. Historical Discourse of Boonton. (Newark, New Jersey: New Jersey Daily Journal Office, 1873). ^ Halsey, Edmund D., et al., History of Morris County, New Jersey with illustrations and biographical sketches of prominent citizens and pioneers. (New York: W. W. Munsell, & Co., 1882), 272, 342. ^ a b c Stellhorn, Paul A., and Birkner, Michael J. "Josiah Hardy" in The Governors of New Jersey 1664–1974: Biographical Essays. (Trenton, New Jersey: New Jersey Historical Commission, 1982), 69–72. ^ Haines, Alanson A. (Rev.). Hardyston Memorial: A History of The Township and the North Presbyterian Church, Hardyston, Sussex County, New Jersey. (Newton, New Jersey: New Jersey Herald Print, 1888), 19. ^ Stellhorn, Paul A., and Birkner, Michael J. "William Franklin 1730–1814" in The Governors of New Jersey 1664–1974: Biographical Essays. (Trenton, New Jersey: New Jersey Historical Commission, 1982), 72–76. Retrieved 29 April 2013. ^ Nelson, William. History of Bergen and Passaic Counties, New Jersey: With Biographical Sketches of Many of Its Pioneers and Prominent Men. (Philadelphia: Everts & Peck, 1882), 204. ^ See: Brahms, William B. Images of America: Franklin Township (Mount Pleasant, South Carolina: Arcadia Publishing, 1997), 106; and Franklin Township, Somerset County, NJ: A History (Franklin Township, New Jersey: Franklin Township Public Library, 1998). Black, Frederick R. The Last Lords Proprietors: The West Jersey Society, 1692–1703. Ph.D. Dissertation, Rutgers University, 1964, Rutgers University Library, Special Collections (New Brunswick, New Jersey). Brodhead, John Romeyn. The Government of Sir Edmund Andros over New England, in 1688 and 1689. (Morrisania, N.Y: Bradstreet Press, 1867). Craven, Wesley Frank. New Jersey and the English Colonization of North America. (Princeton: Van Nostrand, 1964). Cunningham, John. East of Jersey: A History of the General Board of Proprietors for the Eastern Division of New Jersey. (Newark, New Jersey: New Jersey Historical Society, 1995). McConville, Brendan. These Daring Disturbers of the Public Peace: The Struggle for Property and Power in Early New Jersey. (Ithaca: Cornell University Press, 1999). McCreary, John Roger. "Ambition, Interest and Faction: Politics in New Jersey, 1702–38." Ph.D. dissertation, University of Nebraska, 1971. Myers, Albert Cook. Narratives of Early Pennsylvania West New Jersey and Delaware: 1630–1707. (New York: Charles Scribner's Sons, 1912). Pomfret, John Edwin. The New Jersey Proprietors and Their Lands. New Jersey Historical Series, Volume 9. (Princeton: D. Van Nostrand Co., Inc., 1964). Pomfret, John Edwin. Colonial New Jersey, A History. (New York: Charles Scribner's Sons, 1973). Schmidt, George P. Princeton and Rutgers: The Two Colonial Colleges of New Jersey. (Princeton, D. Van Nostrand, 1964). Tanner, Edwin Platt. The Province of New Jersey, 1664–1738. (New York: s.n. 1908). West Jersey Proprietors Deposit at the New Jersey State Archives.